Chimichurri steak is one of my favourite dishes to eat when I’m out so it’s been on my list of things to make for a while. Tonight, needing a meat fix, I decided to give it a whirl and it the result was delicious. The whole meal is lovely and light and summery with some delicious flavours and textures. Pre heat the oven to 180c and begin by popping the BNS chips in the oven. Then in a small baking dish, pop in the tomatoes on the vine and the garlic. Drizzle over the oil and balsamic vinegar and season well. Once the chips have been in the oven 15 minutes, pop the tomatoes in. Next mix together the cumin, coriander and cayenne with seasoning and coat the steak well, rubbing in the spice mixture. Coat each steak in 1 tbsp of chimichurri sauce. Pre heat a griddle pan, spray with 1 kal and cook the steaks to your liking (we like medium rare so 3 or 4 minutes on each side). Once the steak has cooked, pop on a plate to one side to rest. To the same griddle pan, add the asparagus, spray with 1kal and cook for 4-5 minutes to your liking. 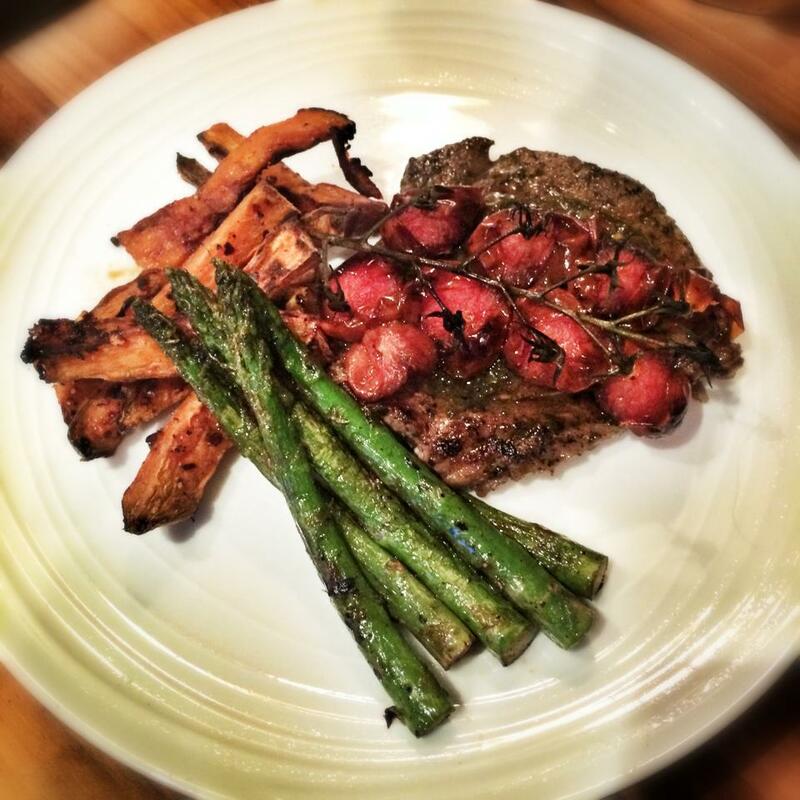 Once everything is cooked, pop onto a plate and drizzle of the juices that have run out of the steak whilst resting.